Headed to college this fall? We have the ride for you. Haro’s Bridgeport dual-sport hybrid is perfect for commuting to school but beefy enough to take some wear and tear over curbs, potholes and rough roads. 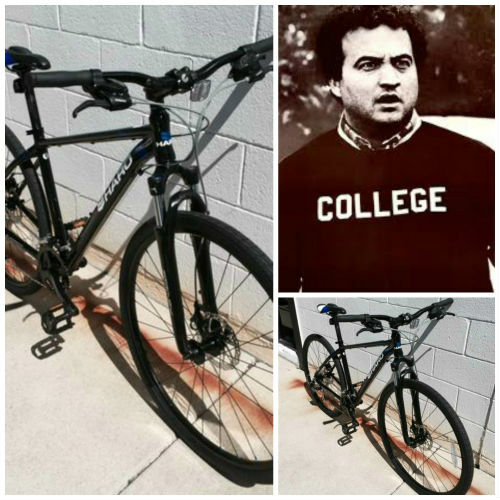 At $499.99, this bike is everything you’ll need and want to get around campus and get around town. Come in today and check it out. Or, give us a call at 303-688-1722 and we’ll give you the 411 on this fantastic bike. And while you’re at it, get the things you’ll need to make sure your ride stays safe and sound. A cable lock, a U-lock and a few tips from our experts will radically minimize the chance that your new (or existing) bike will be stolen. Locks start at $24.99. It’s a small price to pay for peace of mind and a solid ride that will be around when you need and want it. 1. Use both the U-lock and cable lock. Connect the U-lock to the back wheel and the bike frame. If possible, lock the U-lock to the bike rack. If you lock just a wheel, a thief will simply remove the wheel and walk away with your bike frame. Loop the cable lock through the U-lock, the frame, the front fork and the front wheel. Connect the cable to the bike rack. 2. Always try to park your bike in the middle of the rack. Bikes on the ends are more likely to be stolen than those in the middle of a rack. 3. If you have an expensive bike, consider bringing it in at night if that’s possible. 4. Register your bike with the school. Most universities have a bike registry. If your bike is stolen and found later, it will be returned much quicker and easier. 4. Remember: LOCK YOUR BIKE. If you don’t use your locks you’ll lose your bike. Even if it’s just for a minute or two. Ask anyone who thought they’d “pop in” somewhere for “just a second,” and they’ll likely have a horror story to tell afterward.